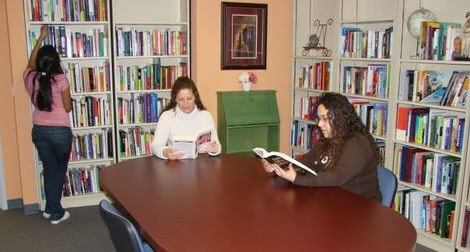 The Patricia Moore Library is a custom designed lending library dedicated to the Disability experience and the rich history and culture that define it . In this comfortable and inviting space, visitors will discover the many aspects of the Disability experience through a variety of genre and media. Books, DVD’s and other materials are available to borrow. A vast selection of reference sources can be used on the premises. A newly added collection of books on holistics and nutrition emphasizes the importance of general health and wellness, especially when living with a disability. Specialized technology provides access to printed material for people with visual impairments. The Patricia Moore Library is open on Tuesday 1- 4:30pm. Professionals and students may also visit by appointment in order to accommodate specific research and scheduling needs. Contact Therése Brzezinski for further information on this option.